American White Pelican (Pelecanus erythrorhynchos) range from southern states to Canada. 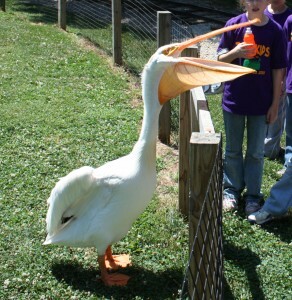 We currently have two American White Pelican named Taylor & Wiley. Both are males. Taylor is named for Lake Taylorville, the place where he was found and caught. On November 22, 2004, the zoo received a call from a resident living on the lake. According to the story, a flock of pelicans arrived in the spring and stayed for about three days. When the rest of the flock moved on, Taylor remained on the lake throughout the summer. The resident was worried that during the coming winter the shallow lake would freeze over and he would be unable to find food. Mike Borders and Dave Webster were able to catch him and bring him to the zoo. Taylor is unable to fly due to an injured right wing. He is missing the portion we would call our “hand”. Because these birds are protected under the Federal Migratory Bird Act, we have to have a special permit from the US Fish & Wildlife Service in order to keep and rehabilitate injured pelicans. Because Taylor was a wild-caught bird, we are not sure how old he is. We did determine that he is a male by sending feathers for DNA testing. During the breeding season both male and females get a breeding “bump” on their beak. You can see the one on Taylor from January through June. Taylor is a big bird…he currently weighs about 19 pounds! His diet consists mainly of smelt, but he occasionally gets live minnows to chase. Taylor is an extremely curious bird. He usually will come running to investigate new things in his exhibit. He loves to pick items up in his beak, so we have to be careful not to leave anything out that he might swallow. He tends to try to “help” his keepers by getting in their way and playing with all their tools. Taylor forms fairly strong bonds with his keepers and likes to be near us, especially when we are in his pen. He tends to enjoy one-on-one interaction and sometimes becomes shy when there are several people around. Wiley’s story is very similar to Taylors. He also came from Christian County in late 2009. He is missing a whole wing and would not have survived the winter. Each year in late winter pelicans will grow an ornamental fibrous plate on the top of their beak, called a nuptial tubercle. After breeding season is completed, this knob will fall off. Pelicans do not grow the nuptial tubercles until they are three years of age. Taylor and Wiley can be found hanging out with the flamingos near the Train Station at Scovill Zoo.